Cindy unless I am miss understanding what the "problem" you think it is. You are talking about the with at the bottom "the length of the foot" that is too long, right? 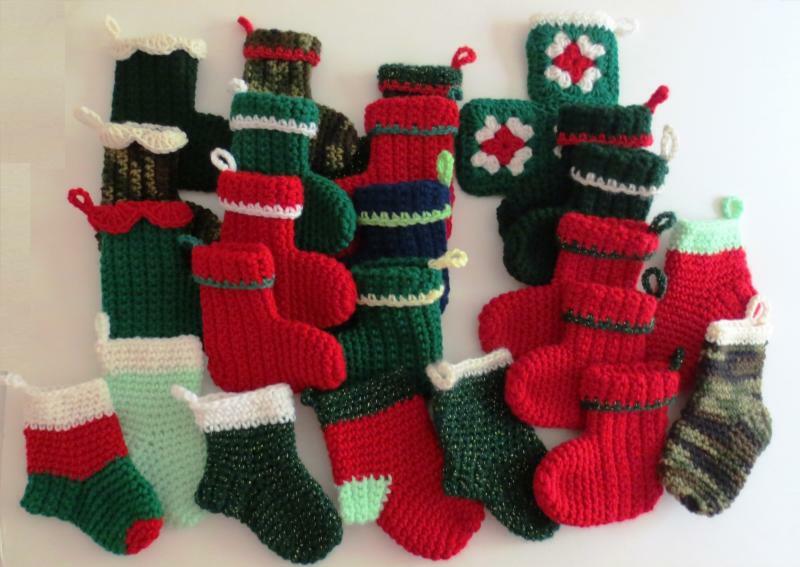 I think the "problem" is that using 6 granny squares (same size) will always make that stocking same size in height as the with at the bottom. According to me the only way to change that it would be to use a different shape pieces not squares. Maybe two rectangles or even a one circle folded in half. I really do not know IF that would look good? LOL. One thing for sure that toe part would not be able to be open to put anything there. But it would have a round nice edge on that tip of toe area and it would be 50% shorter. I don't even know If circle can be crochet with granny stitch? LOL. Or if that circle would not be just a flat circle. kind a like a little bag crochet in rounds. It is like anyone would start ( from the toe are) crochet a stocking. That part would be in rounds and than attached to those squares. that would need to be tried to see how that would work out. That solution from Alp1 sounds good, that would work. In this case you would have only 0,50% (visible part on each side) of that square on that toe area. I probably should not be giving any advices like that. Because many of you here have a LOT more experience than me. There are probably many different ways to try that..
That stocking looks very nice the way it is:). Thanks for all the ideas and I do appreciate your input. I think I might try one with the toe grannie folded at an angle that Alp1 suggested. I folded the toe one over on mine and I think it looks okay and want to try it that way. It is fun to experiment with things and I love to try new sock patterns so I don't get bored. 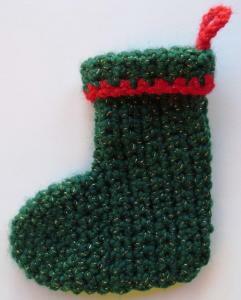 I have the mini cuffed Christmas stocking pattern posted now. After testing and a few changes here is that pattern if anyone wants to try it. Love the new stocking. Looking forward to trying it. Thanks for the pattern. 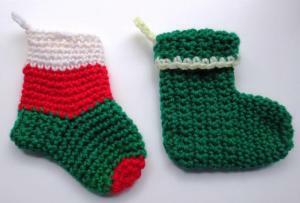 Here are two more mini Christmas stockings I finished up today. Just trying to get a few more done before the deadline which is November 1. I just wanted to post an update I got from the Warmth for Warriors. They have received a total of 1040 mini Christmas stockings already this year. They said more are coming in so please let's make a final push before the delivery deadline to them of November 1. Here is a link to a Facebook post about the progress so far. A big thank you again to everyone for your help! I mailed off my stocking's. I finished 22 of them. Hubby told me to mail them. So We fasted for 2 meals and used what we would of spent on food to mail off a couple packages. I also received a card from them letting me know they received them. Oh thank you so much! Your stockings are going to be so appreciated by the troops and it's wonderful how you fasted to be able ship your packages. 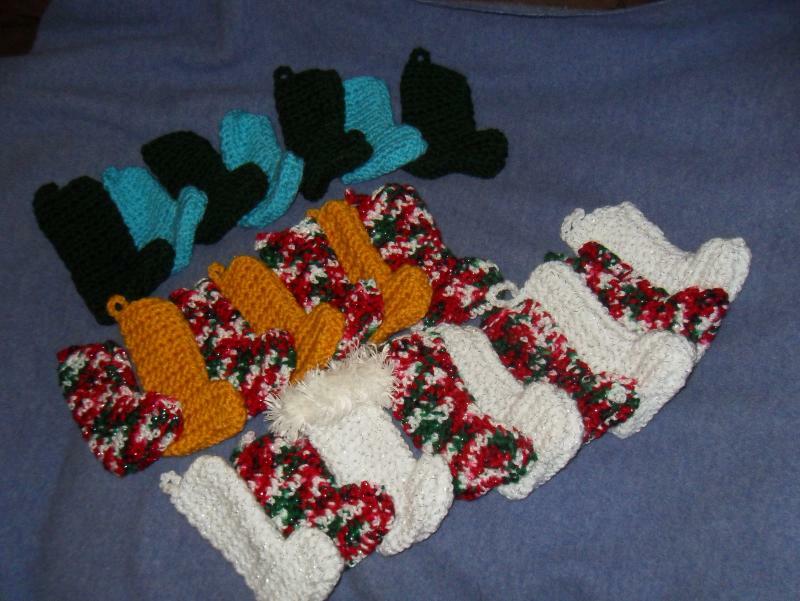 Here are my 24 mini Christmas stockings that I have packed up for shipping for Monday. I might make few more this weekend but will have the box ready to ship out Monday morning. The final deadline is fast approaching for stockings to be shipped and delivered by Warmth for Warriors. Just a reminder that they want all stockings by November 1. So please ship any stockings you may still have asap. I will post the final tally of stockings received by Warmth for Warriors once I receive the total from headquarters. Cindy would you let us know as soon as you find out if they are going to collect stockings next year. I am thinking that I could do them as my default project---times when I am in between projects, dont quite know what to do next but feel the need to be working on something? Brenda I think they are collecting those stockings every year. I was just looking on their site "Warmth for Warriors" and it says: " It is NEVER too early to be knitting Christmas stockings for our overseas personnel!" I will try to remember thru the year and crochet them sometimes when I will have a time. I did not knew anything about that project until few weeks ago. I find out about that project by coincident from a member here. What I mean by "coincident " it was because she told me that she is working on stockings for Cindy. Since I always want to know "everything" LOL So I ask her :"why she is making those stockings ?" Because I thought that maybe it was little early to be working on stockings. That was how I find out. Cindy would you let us know as soon as you find out if they are going to collect stockings next year. I am thinking that I could do them as my default project---times when I am in between projects, don't quite know what to do next but feel the need to be working on something? The Warmth for Warriors has been doing the annual mini Christmas stockings for several years. Each year the Board decides what projects they will be supporting and I am sure they will continue with the stocking drive but I will let you know for sure once they announce it. These are the ones I sent off last month. There were so quick and fun to make I plan to make them for next year too and already have the yarn purchased. So very wonderful all the stockings you made. Thank you and I got a message from one of the board members for Warmth for Warriors and she said they have every intention to continue the mini Christmas stockings next year. So keep on making stockings for next year when you can. I host the Boxing Day CAL (any charity times) over on the next page. I put a reminder in my calendar to put your info up around August next year. I made a few one year but my heel was too pointy so I gave up, but there are a few new patterns here so I am going to print and practice right now so I can get some made for next year. Thanks to everyone here for all you have done. Amazing. Final numbers are in for the 2016 stocking drive for the Warmth for Warriors. 1680 Christmas Stockings this year which just beat out last year’s total that was 1678. A huge thank you to each and every one of you for contributing to the Christmas stocking drive and for supporting our troops. The stocking drive will be held again next year so if you want, you can start now for next year's drive so we can get a jump start. Hey Cindy its not too early to start sending these is it? I have a large envelope overflowing with them as making them has become my go to thing when I want to keep my hands busy but havent decided what to start next. No it is never too early to send your package! They except stockings all year-around. I started making some myself lately. I should start a 2017 stocking thread for Warmth for Warriors. Thank you in advance for helping us. Okay. I made some using your mini Christmas cuffed stocking pattern. It was easy to follow and worked up nice. Oh yes please go ahead and start us a new thread. I will try to snap a few photos to post there.